Having been kicked out of his home, John McTiernan is now accusing First Interstate Bank of swindling him. The director of such blockbusters as Die Hard, The Hunt for Red October and Predator went to jail in 2013 over false statements made to the FBI during its investigation into the activity of private eye Anthony Pellicano. When he got out of a South Dakota prison in February 2014, he found himself in the midst of a war-of-words with the bank that held debt secured by his 3,254-acre ranch in the heart of Wyoming. No longer incarcerated, McTiernan plotted a Hollywood comeback, and told the judge of a forthcoming Top Gun-type film starring John Travolta plus other potential projects, and while he was able to stave off the bank's heavy-handedness for a short while, First Interstate Bank was ultimately successful in having a liquidation plan accepted in bankruptcy court. McTiernan demanded time to sell the ranch for its full value, but the bank called his plan to pay debts a "pipe dream" and doubted the director's cash flow projections. After liquidation was approved, priming the way for a forced sale of the ranch, a bankruptcy plan administrator brought a motion to require him to vacate the property. McTiernan objected, but on Wednesday, he filed court papers with pictures of the vacated premises. "The McTiernans are not setting up another household," states his court papers. "They are emigrating. Asking that they squat in the local motel while packing the rest of their belongings will accomplish nothing, and can only be seen as vindictive, particularly since they are and will continue to be charged more than double normal mortgage interest for several months into the future." McTiernan is currently staying in a "manager's house" next to his offices. Meanwhile, he launched an adversary proceeding against First Interstate this week. The complaint begins with a quote from Thomas Jefferson ("I believe that banking institutions are more dangerous to our liberties than standing armies") and alleges that shortly after he was charged by federal prosecutors in 2006, the bank came to him as "a wolf in sheep's clothing" with an offer to give him a "revolving line of credit." He now asserts that its true motivation was to seize the ranch from him. For a $5.5 million loan, McTiernan was paying a variable interest rate that was as low as 3 percent in 2009, but climbed to 8 percent in 2012. He says he attempted to access the promised revolving line of credit, but was denied. Meanwhile, the loan reached maturity. Around the time of his jailing, McTiernan suffered financial pressures. The IRS at one point put a lien on his property while his ex-wife Donna Dubrow was owed spousal support and was pursuing a privacy invasion lawsuit connected with the hiring of Pellicano. The bank's loan was not extended despite what McTiernan alleges was represented to him. The director was also upset about an appraisal done on the ranch, which he says was lowballed at $8.95 million "to assist FIB in encouraging McTiernan to sell the Ranch at a below market price." Before he went to jail, McTiernan says he was forced to sign a "Change in Terms Agreement" that headed off an immediate foreclosure, but provided that if he was incarcerated, he would be in default and that the interest would climb to 11 percent. 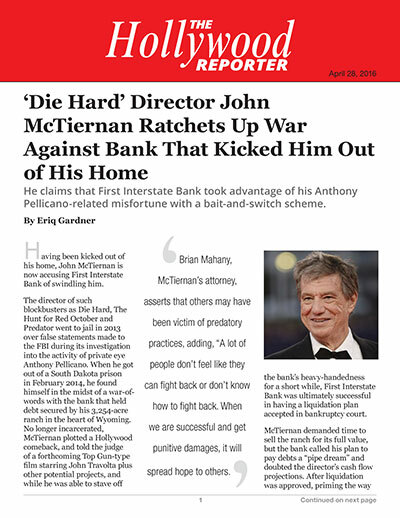 Put in jail, the director says the bank "seized on McTiernan's misfortune" and got him to incur $600,000 in interest. He considers what happened to be a "bait and switch." He's now suing First Interstate for economic duress, breach of fiduciary duty, breach of the implied covenant of good faith and fair dealing, breach of contract, fraudulent concealment and fraudulent inducement. Brian Mahany, McTiernan's attorney, asserts that others may have been victim of predatory practices, adding, "A lot of people don't feel like they can fight back or don't know how to fight back. When we are successful and get punitive damages, it will spread hope to others." The bank's attorney hasn't responded to a request for comment.